Don’t hesitate to let the driver know if you are partially sighted or require assistance to identify your destination. When your 'buggy friendly' bus arrives, you should lean the buggy onto its rear wheels, move the buggy forward and lower the front wheels onto the bus. You can ask the driver to lower the step if you need to. Do not try to board when the step is lowering, as you could trap your buggy's wheels between the step and the kerb. Don't hang shopping or other bags on your buggy, it could tip over. The first thing to remember is to make sure the bus has come to a complete stop before moving forward. Before attempting to get off the bus make sure that the bus is not in the process of lowering. This is to prevent your buggy’s wheels becoming trapped between the bus step and the kerb. Unfortunately, there is limited space for buggies on board our buses. This can vary depending on the bus, the number of pushchairs and the size of them. If there are already buggies on board, the driver may ask you to fold it. Please help us make the trip safe for everyone and don't block the aisles or exits of the bus with your buggy. Currently, not all of our buses are 'buggy friendly'. If this is the case, you’ll need to fold your buggy and put it in the luggage rack. Don't worry, the driver will give you time to do this and will help you if needed. Of Course, wheelchair users have priority over everyone else for the use of the designated wheelchair space, since this is the only place in which they can travel safely. Non-wheelchair users, unlike wheelchair users, will normally have a choice about which part of the bus to sit or stand in. Common decency and respect for wheelchair users should mean that other passengers make way for them. Passengers are urged to offer cooperation in allowing proper use of the designated wheelchair area. If the wheelchair space is occupied with a buggy, standing passengers or otherwise full, and there is space elsewhere in the vehicle, the driver will ask that it is made free for a wheelchair user. Where a pushchair or buggy is occupying the space, the driver will ask that it is repositioned, moved to another part of the bus or folded and stored in the luggage space, where available. Folding bicycles are welcome on board our buses, however we do ask that you fold them and place them in an appropriate space. For everyone’s comfort and safely, we ask you to make sure they’re not blocking the aisles or access to any seats. Due to space and safety considerations, standard non-folding bicycles cannot be carried on our buses. Many First buses are built for easy-access, making it quicker and simpler for wheelchair users or people with pushchairs. With more bus stops now being adapted to be more accessible, it’s never been easier to travel. Here at First Bus, we’re always looking for ways to improve access to local bus services for users of mobility scooters. We’ve been working with the Confederation of Passenger Transport and the Department for Transport, to develop the Mobility Scooter Code of Conduct. There is currently no legislation on the carriage of mobility scooters on local bus services, and therefore this has become something of a "grey area" with different policies and practices. The Code is designed to be a clear and concise guide to the carriage of mobility scooters on local bus services, reducing confusion and uncertainty for users and helping to prevent situations of disagreement and conflict concerning accessibility. Please read The Code, and take the appropriate action before trying to take a mobility scooter onto one of our buses for the first time. For further information or to arrange a training session to obtain a 'permit for travel' please contact us. The First Safe Journey Cards has been designed specifically for our customers who may need some extra help to make their journey. The card gives you the chance to tell the driver what extra help you may need to make your bus journey. From needing more time to reach your seat to needing the driver to speak up because you have trouble hearing, the card is there to help. Whatever your need, you can use these cards to let the driver know in a private and discreet way. There are even blank spaces for you to fill in yourself for details of your destination or special instructions. After speaking to many disability groups around the UK, we’ve designed a card to help give people with disabilities a way of letting the driver know that they may need additional help. The card includes messages such as 'please be patient, I have a hidden disability', 'please face me and speak clearly, I lip read', and 'please help me find a seat'. There are also some blank spaces for you to use if you want to include your own personal message. Make sure you keep the card with you when you travel at all times, and when you get on the bus simply show it to the driver, who will then offer you the necessary assistance. Don’t forget, these cards are voluntary, so you don’t need to use one if you don't want to, but you may find it a useful way of asking for any assistance you may need. As part of our commitment to providing accessible travel for wheelchair users virtually all our buses have a dedicated area for wheelchair users; other passengers are asked to give up the space for wheelchairs. When your low floor bus arrives at the bus stop you can ask the driver to lower the step and/or ramp to allow you to board. Please ask the driver for assistance if you require any help. You should reverse your wheelchair into the dedicated area on board (so you are facing the back of the vehicle) and apply the brakes. 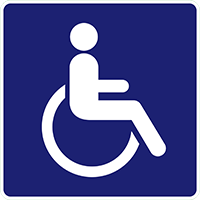 Wheelchair users have priority over everyone else for the use of the designated wheelchair space, since this is the only place in which they can travel safely. Non-wheelchair users, unlike wheelchair users, will normally have a choice about which part of the bus to sit or stand in. Please note that the driver has no power to compel passengers to move in this way and is reliant upon the goodwill of the passengers concerned. Unfortunately, if a fellow passenger refuses to move, the wheelchair user will need to wait for the next bus. If the bus is full or there is already a wheelchair user on board unfortunately we will not be able to carry another wheelchair user.